Judy Millar’s work hit me right in the belly as soon as I first saw it. It was a gut feeling, preceding rationalization. I didn’t know about her intentional emphasis on a dialogue between architecture and painting, between space and the painted surface. said Millar to her interviewers Karlyn de Jongh, Sarah Gold and Valeria Romagnini, published in the November issue of Sculpture magazine. 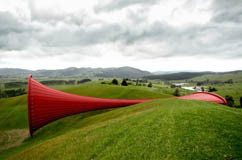 When I flipped backwards the pages of the magazine, I was hit again by the works of Anish Kapoor and Richard Serra at the Gibbs Farm in Auckland, New Zealand, presented by John Finlay. To compare these artworks literally is impossible. Miller’s convoluted paintings are temporary installations to be rolled and stored once a show is over, hopefully to be resuscitated under different forms within different spaces. Kapoor’s and Serra’s monumental artworks are meant to become an eternal link between earth and heaven. Yet all three artists have something in common: they engage space and place at an architectural scale. 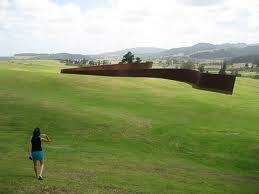 By comparison to the complexity of the works at the Gibbs Farm, Millar’s work is Arte Povera. In that resides its strength: it has a tangible applicability for the future. Rather than wait for an invitation to become part of an architectural environment, like Barbara Kruger’s PICTURE THIS at the North Caroline Museum of Art, Millar engages space as the opportunity comes: within a church, at a gallery, in a Venetian palazzo. The architectural scale of Richard Serra’s Te Tuhirangi Contour, 252 meter-long by 6 meter-high construction in Cor-ten steel plates, and of Anish Kapoor’s Dismemberment, Site 1, a steel and PVC sheeting stretched 85 meter-long between two giant metal rings, seem to me like Stonhenge statements of the twenty first century commissioned by a contemporary Cosimo de’ Medici, Alan Gibbs. One can only hope that works of this caliber become contagious and reach the domain of architecture awareness sooner rather than later.